Have you ever imagined yourself with your baby on one side and a humongous bag containing your baby’s essential things on the other? You quite probably might look like a circus performer balancing and maneuvering around with both your hands! Bags may come in handy to hold the things you and your baby’s essential things as you travel around. But not all bags are alike when it comes to carrying and organizing the stuff your baby needs. A backpack was the next big thing to help you carry the baby bringing along their essential things. Think about posture and balance! 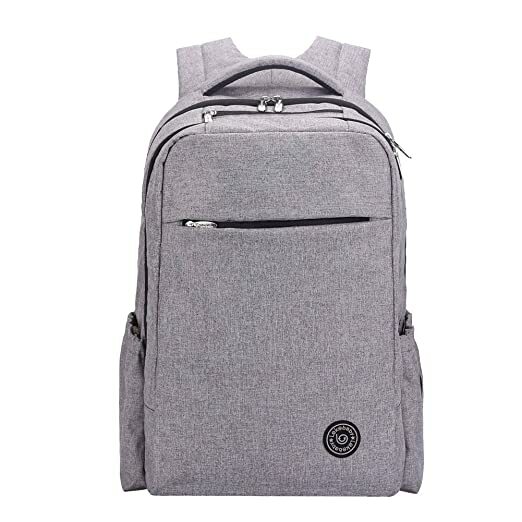 A backpack diaper bag was one of the best bag allies of every mom that greatly help in improving the balance of the weight in your body and take off the load off on one side against the other side especially when going and moving places with the baby. Why do you need a diaper backpack?Above all, a diaper backpack helps balance your body out. Since you carry the backpack diaper bag on your back, it gives all the freedom to both your hands and uses for other functions. You have more freedom to hold your baby as you less struggle on the now manageable weight on your back. It sounds pretty exciting but it really makes an awesome difference with less weight burden, a ready hand to unlock doors, unload stuffs and practically do things with your hands free from weight and pressure. A diaper backpack can prevent you from toppling over. When your back and arm have strained holding the baby and loads as you go up and down the steps. To help you further look or buy the bag you might need, the following are the best features of an ideal backpack diaper bag. Empty bags with much weight when empty will be presumably be heavy when loaded. It is, therefore, best to choose light weight bags when empty. Make sure the fabric was strong and sturdy enough to hold and carry baby’s essentials like feeding bottles with liquid content and cans of milk formula. Avoid materials that can easily rip, stretch or sag and can cause inconvenience later on. Spacious that air can at least circulate especially when baby’s soil clothes and nappies are wet to avoid moisture and mildew that could contaminate and make bacteria thrive. 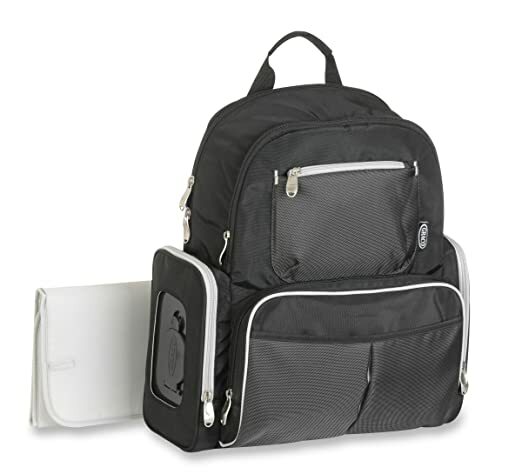 Some distinct features of most diaper bags are the pockets and compartments. It is best that one or more functional use can be done to the pockets other than storage of a specific thing. Dual functioning or multi-purpose usage of the compartments will give you more value and purpose especially for its price. In the long run, multiple pockets will sharpen your organizational skills and will make it easy for you to think of other uses of each pocket. Sometimes creativity and ingenuity work best as a likely challenge to master the task. The more pockets, the more ways and uses they can be. It’s as simple as that. Parents, especially career moms and dads rely on the versatility of a backpack diaper bag. Its features must be as functional as it can be. A side big pocket or flap can turn and be made as a changing pad to enable quick diapering in between travels. Pockets can be used as bottle or cup holders while clipped on the baby’s stroller. Insulated compartments may help in keeping the milk inside the feeding bottle warm or other drinks cold. The bag must be versatile enough to cater for every modern parent’s role. The bag must adapt from being a mom to a career woman and the housekeeper who handles the shopping and marketing for her family. While dad can use the bag during his turn as baby’s caregiver to put things for his gym sessions. Another of the many innovation and function on its roomy inside was a slot for devices like laptop, cellphones, books, pens and other office tools. For the bag may likely to act as mom and dad’s office drawer wherever they might be with their baby. The innovation on the functionality of the diaper bag must likewise adapt to the changing adventures and challenges of today’s modern parents. Choose fabric or surface materials that can easily be cleaned or wiped. Avoid safety hazard buttons, buckles, straps, locks and harnesses to avoid untoward accidents. Do remember that the unit must ease and save you from the weight struggles and tangles. Adjustable handles, pads and cushions are just some of the must-have convenience features of the bag. Without proper padding and adjustments, the bag can cause uncomfortable weight and may lead to chaffing and dig unto your skin. A well suited bag exceeds the standards of what you’re looking for, yet economically priced. It’s best to invest in something worth the value of what you’re going to pay. With all the good things and benefits of having a backpack diaper bag as an essential for parents who have babies and infants to bring along, we’ve gathered along some of the best backpack diaper bag we found and here they are listed below. 18 pockets each offering unlimited ways to organize you and your baby’s essential needs. Made with the highest quality of 100% polyester fabric. Ideal for beginner and starters. Breathable and fully padded outer fabric material. Sturdy and easily washable to clean on the go. ​Adjustable shoulder straps to let you conveniently carry the weight. ​Available in top designer designs but without the heavy price tag bust. Padded top handle for convenience. The insulated pockets as bottles do not exactly fit in. But of course not all bottle sizes are the same. Does not expand as ideally shown on published samples. I doubt with my baby’s activity, this might not withstand everyday use. Lekebaby Extra Large Baby Diaper Bag Backpack has everything every mom can look for in a diaper bag big enough to accommodate your baby’s growing essential things with unbeatable unlimited storage options carrying and storage options and convenience without being pricey as one of the best backpack diaper bag around. Skip Hop is perfect for busy and working moms who have to juggle between babysitting and office work. With its nicely designed patterns, you can still be stylish and fab having a baby with you. Matches with most office work ensemble. Skip Hop Baby Forma Pack and Go Diaper Bag Backpack was made with 100% polyester fabric. Front section pockets allow easy access to its content. Include insulated pocket cubes perfect for bottles. The multipurpose mesh compartments are perfect for clothes and snacks. It has changing pad pocket that can hold tablets and laptops with monitor size up to 15". Comes with elasticized interior cell phone pockets. Comes with two bottle pockets on the outside. Elasticized interior cell phone pockets. Zipper zips on both sides allowing the bag to sit upright. Fewer interior pockets than other brands of the same type. Bottles and cans fall out due to poor elastic binders to hold contents of the designated pockets. Thinner padding to protect the inner pad pocket that holds diapers as well as other things like phones and gadgets. Less padding support on straps needed especially for broad shouldered and tall users. Skip Hop Baby Forma Pack and Go Diaper Bag Backpack multi-purpose functionalities and adorable designs will make you enjoy and cherish every moment with your baby. Value for money is what every Bag Nation likes to vouch for its bags. Versatility wise, it can generally understand how busy we moms are and functions well when we need it most. It’s just a pity they look dull with their colors and pattern. I love colors the way I enjoy the hues brightening up my day. Bag Nation Diaper Bag Backpack confidently offers its valued customers with lifetime warranty and supports their customers no matter what. Their outstanding support team was only a message away. They believe that hands-free is how their ideal product should be. Bag Nation Diaper Bag Backpack will reliably hold all your essential baby needs without both your hands holding on to them. You baby’s diapers, clothes and food, and other extras can all be organized in the Bag Nation Diaper Bag Backpack freeing up both your hands and give you more hands and attention to your baby. Made from sturdy, high-quality water resistant twill polyester with heavy duty zippers and attachable to your baby stroller. The streamlined stitching on its water resistant polyester twill is stronger than cloth materials. ​With its 14 pockets equipped body, there is one for your every need, so you can better organize your supplies and your baby’s supplies with ease. The bag gives back more value by offering valued customers 100% satisfaction guarantee! Added convenience comes to your diaper bag with the inclusion of a large yet durable changing mat and a sundry bag to readily get everything you need right away. Other than the issue of stressed fabric which can be visible over a period of time due to use, this diaper bag live up to its functionality and standard. It’s okay to perfectly fall in love with the Bag Nation Diaper Bag Backpack design to carry anything you need without being overly large and bulky. If there is one so-called ‘hall of fame’ in backpack diaper bags, I will be delighted to recommend Ju-Ju-Be Be Prepared to it. Starting from its delightful design to the efficiency of usage of every pockets and sections in the bag, I couldn’t really have enough the many ways I can fill in. Don’t just stare on how beautiful they look like, buy it before it’s gone! I don’t think they produce much with each type and model. I don’t mind stuffing it until it bulges so long as I know how to properly use it to my advantage. Go! Stop reading mine and be the judge for yourself. Comes with smart friendly all usable pockets for that easy yet fully-organized convenience. The Teflon treated outer fabric was protected by Agion antimicrobial lining for that ultra and safe clean protection and 3M Thinsulate for the insulated bottle pockets. The 3M Thinsulate in Ju-Ju-Be Be Prepared Diaper Bag perfectly insulate bottle pockets for you to conveniently enjoy cold or hot drinks. Adjustable straps equipped with memory foam for maximum comfort on your shoulders and in the included changing pad. The Ju-Ju-Be Be Prepared Diaper Bag come with a 90-day limited warranty for manufacturing defects. Comes with the stain-resistant Teflon material with antimicrobial lining for easy drain and clean. Roomy interiors great for overnight trips, plane ride travels for moms of multiples. The Ju-Ju-Be Be Prepared Diaper Bag has multi-color tabs to help you organize baby or kids things. The bag turns bulky and bloated if overfilled losing its original shape and form. 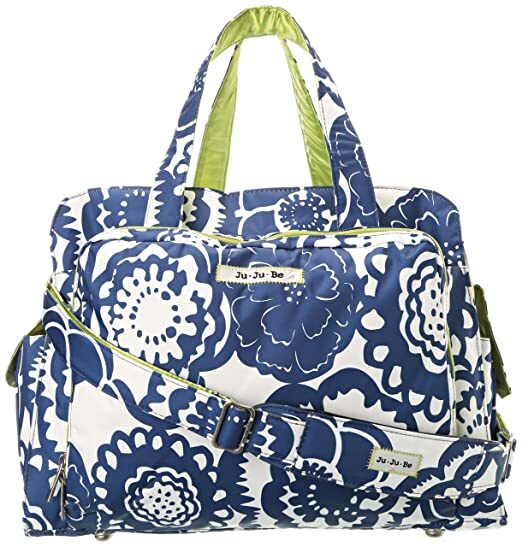 Ju-Ju-Be Be Prepared Diaper Bag is for the ultimate over packer mommies going for an overnight travel with her twins or another child. Graco quite has that awesome look in baby’s diaper bags. Safety is what moms like us earn from this bag. I simply love how they keep things inside still and intact even through rough and bumpy road travels. The bag holds your stuff just like how doggie gnaws on its bone. Graco is one super reliable bag for your next great outdoor getaway. 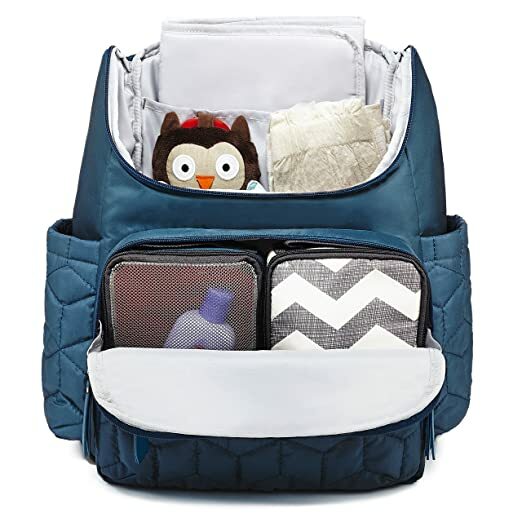 When it’s time to go away from home, Graco Backpack Diaper Bag with Smart Organizer System is your best travel buddy! Easily adjustable top handle and padded shoulder straps. ​Long, double handles for easily carry on the go. ​Includes pad for changing diapers. ​Insulated bottle container pockets to manage cold or hot drinks handy and organized. 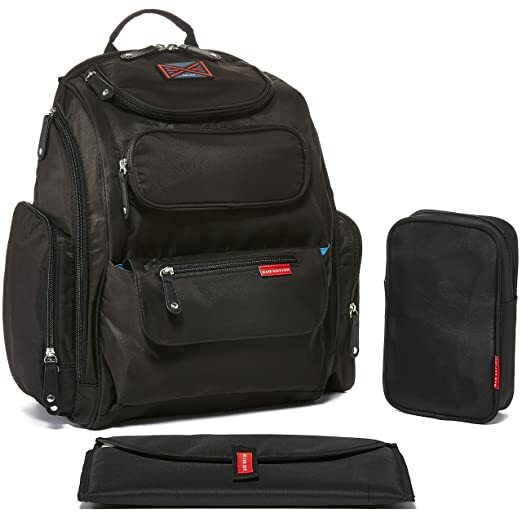 Front pockets are equipped with pop-open flaps fit for hard wipes cases. Back pocket to conveniently store detachable changing pad. Stroller straps are not included. Long and narrow inside pockets. 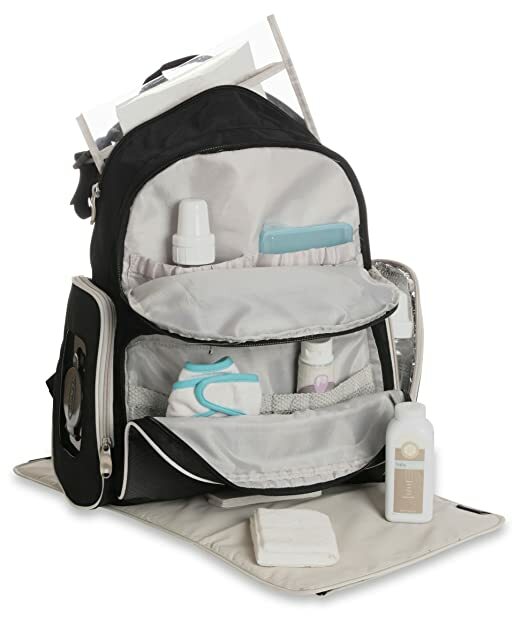 The Graco Backpack Diaper Bag with Smart Organizer System offers easy carry all and organization in one. It is best for bringing along all baby essentials, like feeding bottles that can easily slide fit in its exterior side pockets. Baby’s nitty items that can be securely placed in the zippered front pockets. Baby clothes and diapers will nicely fit in the spacious inner compartments. It comes with an insulated bottle pockets as well as easy access pocket for baby wipes that conveniently pops open for easy and quick clean up. Comes with a detachable and easy to organize on the go baby changing pad for that easy and convenient baby diapering, a feature making it one of the best backpack diaper bag in the market today. Whether it's your day for running errands or a weekend stroll, a backpack diaper bag will save your day and help you carry your baby’s things with ease. It also lets you enjoy most and experience your best moments with your baby. The bottom line of why backpack diaper bags were invented is to balance the weight of the bag and its content on your back as it helps you regain and maintain your balance and free your hands to instead function tending your little bundle of joy. Their versatility of usage exceeds their original use as holder of baby diapers as they can also be used to store other essential things the baby needs as they grows. Just like how it is in business, investing your money with the most ideal and not on the popularity will be the best rule of the thumb for the best backpack diaper that can give value and benefits in the long run just like how we see and gauge on the features and functionality of the Ju-Ju-Be Be Prepared Diaper Bag whose brand has proven its standard through the years against its par and competitors but remains true to the trusts of the parents of babies and toddlers who have relied greatly on their product. Isn’t it great to have a reliable partner around like these ideal backpack diaper bags we’ve presented above? Why not share us your insights by writing your thoughts on the comments below? Hello everyone, when you guys come here probaly you have so many questions about pregnancy, babies but you still doesn't have your satisfactory answer, I empathize with you and your family because I also lived through that difficult time. I already passed and now I have 2 lovely babies, they are so meaningful to me. With my hobby of writting style, I'm sure I will make all of you pleasing. How Many Swaddle Blankets Do I Need: An Answer You Never Expected! How Early Can An Ultrasound Detect Pregnancy? The Answer Might Surprise You! ProjectOfParents.com is a participant in the Amazon Services LLC Associates Program, an affiliate advertising program designed to provide a means for sites to earn advertising fees by advertising and linking to Amazon.com. Additionally, ProjectOfParents.com participates in various other affiliate programs, and we sometimes get a commission through purchases made through our links.